Despite a mild winter, it has been cool on the NET test center. Recently, NET has performed compression testing on plastic products in minus 30 degrees. The low temperature leads to a reduction in movement of large parts of the molecular chain of apolymer ("Plastic"). When a liquid polymer cools down, it turns into a rubber-like material and eventually becomes a solid. The temperature at which the polymer turns to be solid is called the glass transition point. This temperature is rarely at a completely defined limit, and will vary from plastic type to plastic type, and usually extends over a temperature range. When testing at minus 30 degrees, certain types of plastic behave like a completely different product than it would at room temperature. After passing the glass transition point, the soft properties are greatly impaired, which means that the product can be crushed. Something that would never be posible at higher temperatures. Testing at such low temperatures puts its own requirements on the equipment, but it also makes it possible to see what a plastic product will be able to withstand in a Nordic climate. 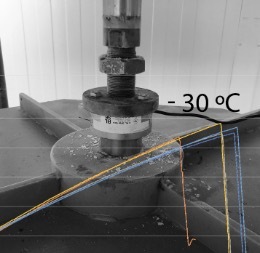 At NET, we are able to perform such testing in the temperature spectrum - 30 ºC to + 60 ºC. In addition, we have EX safe climate rooms that makes it possible to handle flammable substances in the same temperature range. The fact that NET chooses to use climate rooms with such qualifications over climate chambers means that both equipment and larger packaging can be kept under the same climate, which gives greater flexibility.